We have made it to the final weekend of Hockey East play and the Boston University men’s hockey team is still alive. After missing out on a golden chance to host a conference quarterfinal series, the fifth-seeded Terriers responded with fervor to knock off fourth-seeded UMass Lowell with two wins in a best-of-three series this past weekend. While doubts had circled overhead leading up to the series, the Terriers impressed last weekend in Lowell. They could have been discouraged after relinquishing the chance to stay at home, but they instead unleashed their rage on the helpless Riverhawks. “They earned it,” said BU head coach Albie O’Connell of his Terriers. In the opening game of the series, junior goaltender Jake Oettinger saved all 25 UMass Lowell shots on goal, pitching his 13th shutout as a Terrier to tie the program record. Meanwhile, his offense took care of him as freshman phenom Joel Farabee scored early in the second period to break a scoreless tie, and Cam Crotty and Patrick Curry finished off a 3-0 victory for the Terriers. After a 6-4 loss on Saturday night, BU closed the door on Sunday afternoon. The Terriers have struggled in the first period often in the second semester, but that did not happen with the season on the line. Junior defenseman Chad Krys, Farabee and junior forward Patrick Harper said goodnight to Tsongas Center with a goal each in the first period and BU proceeded to win, 4-1. “I thought we played a good hockey game from start to finish,” said BU head coach Albie O’Connell after securing the series-deciding victory. As a result of their victorious weekend in Lowell, BU receives the opportunity to defend its Hockey East crown this weekend, starting on Friday in the semifinals against Northeastern. The Huskies roll into this matchup having won nine of their last 10 games. However, the Terriers have enjoyed relative success against their counterparts from Huntington Ave.
Each team has won once in the season series in addition to a 5-5 tie at Matthews Arena on Nov. 1, one of the more entertaining games of the season. BU entered the game winless and Northeastern scored twice in the first four minutes. Unfazed by the early hole, the Terriers made a statement that Thursday evening in front of a raucous road crowd. Sophomore forward Logan Cockerill netted a highlight reel goal the slice the deficit in half before the first stanza concluded. Patrick Curry knotted the score in the second period off assists from sophomores Kasper Kotkansalo and Ty Amonte. The lead then changed hands multiple times before ending in a tie. Two nights later, the Terriers hammered the Huskies, 4-1, at Agganis Arena for their first win of the season. In that contest, junior defenseman Dante Fabbro scored the first pair of goals before senior forward Bobo Carpenter and Curry netted goals in the latter part of the third period to give BU a 4-0 lead. The teams met again on the first Monday of the Beanpot, a rematch of last season’s lopsided Northeastern win in the tournament finale. This tilt was a classic. Each team scored in the first period with junior defenseman Chad Krys doing the honors for the Terriers. After that, neither team was able to put one past the keeper before Northeastern freshman forward Tyler Madden ended the game with a goal 51 seconds into overtime. The Huskies have been scary at TD Garden over the past two years, but there is no reason why BU can’t beat Northeastern at the Bruins den for the first time since 2016. “I’d be scared to play the Terriers at the Garden,” remarked Farabee. Should the Terriers best the Huskies, BU will be taking on the winner of Friday’s nightcap between the University of Massachusetts and Boston College. Finishing as the Hockey East leaders in dominant fashion, the Minutemen hosted eighth-seeded University of New Hampshire in the quarterfinals. UMass suffered an early scare in their series with the Wildcats, going down 3-0 just past the halfway point in Game One. However, the Minutemen rallied for the 5-4 victory in overtime, and finished off the visitors the following night with a convincing 6-0 thrashing of UNH. On the other side, Boston College had an underwhelming regular season, finishing in the conference’s seventh seed. However, the Eagles came through when it mattered, taking down Providence College on the road last weekend. The series went the distance, with the first two games getting split by way of two overtime finishes. Level through two periods in Game Three, BC would gain an eventual winner, shocking the hosts and leaving with the series win. With so much potential variation in what could occur, only one thing is certain – it is going to be an exciting weekend of Hockey East playoffs at the TD Garden. Tune in to the games on NESN, and follow along with BU hockey through the Boston Hockey Blog’s live blog during the game. 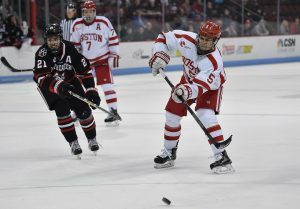 The Boston University men’s hockey team had a golden opportunity to finish in the top four of the Hockey East heading into last weekend. Maine had other plans, silencing the Terriers (14-16-4, 12-9-3) in a 6-0 shutout that bounced BU into the Hockey East tournament with a sour taste in its mouth. The Terriers had the chance to eclipse UMass Lowell in the standings with a win against the Black Bears. The result was far from satisfactory, however, forcing BU to make the trek to Lowell for the quarterfinal round of the Hockey East tournament this weekend. The best-of-three series will begin on Friday night at Tsongas Center, extend into Saturday night and conclude with a Sunday afternoon Game 3 if necessary. This should be an entertaining affair as these two teams split the season series with each team taking care of business on the road. In the first meeting on December 7, the Riverhawks (18-11-5, 12-7-5) continued the Terriers rough beginning to the season with a 5-3 win at Agganis Arena. UMass Lowell scored twice in the first period to take a 2-0 lead, but goals by sophomore forward Ty Amonte, sophomore defenseman Cam Crotty and senior forward Bobo Carpenter evened it up at 3-3 early in the third stanza. The Riverhawks took control from there, however. Freshman defenseman Seth Barton scored his first career goal 7:45 into the third period to give his team a lead they would not relinquish. The series moved north to Tsongas the following night and that result should give the Terriers confidence they can go to Lowell and win this playoff series. BU responded well from its defeat the previous night. The Terriers scored three times in a four-minute stretch in the first period to take a 3-0 lead. Carpenter accounted for two of those tallies with sophomore forward Shane Bowers chipping in the other one. Sophomore defenseman Kasper Kotkansalo assisted on the first two goals and BU continued its offensive dominance in the third period. Junior forward Patrick Curry extended a one-goal lead to 4-2 five minutes into the last frame before putting the game out of reach by assisting on Bowers’ second score of the night with three minutes remaining. “Guys know their role and understand how we have to play to be successful,” O’Connell said. That win signaled a massive swing of momentum for BU. This game kicked off a five-game streak without a loss, a stretch which included crucial Hockey East wins over New Hampshire and Providence. Do you think BU can advance to TD Garden? Let us know below! Entering their final regular season game, the Boston University Terriers (14-15-4, 12-9-3 Hockey East) will face the University of Maine Black Bears (14-15-4, 10-9-4 Hockey East) in a Saturday battle at 7:30pm in Orono. The Terriers tallied yet another big win last week, beating last seeded Merrimack 5-1 at Agganis Arena on Saturday night. Not only is BU looking to continue their five game unbeaten streak, but they are trying to climb as high up in the conference rankings as they can. “[There is] quite a bit [of pressure] I think,” said junior defenseman Dante Fabbro regarding the Terrier’s upcoming game against Maine. The co-captain had an outstanding performance in the Merrimack game, tallying 5 points. BU has the opportunity to land in the 3, 4, or 5 seeds heading into the Hockey East tournament depending on this weekend’s conference results. The top four positions host first round playoff matchups, so the fifth-place Terriers are still on the outside looking in at UMass Lowell one point ahead, and Northeastern two points ahead. BU hold the tiebreaker over these two teams, so if BU wins against Maine and Northeastern loses against UNH, BU will overtake Northeastern. In addition, if BU wins or even ties against Maine and UMass Lowell loses against Vermont, the Terriers will jump above UML. It is no a secret that the game against Maine is not going to be a walk in the park for BU. The two sides already met twice back in November when the teams split a home-and-home series. The first night in Boston, BU won 3-2, while the next night Maine grabbed the win on their home ice with a 3-1 victory. “I think if we keep building off of things we have worked on in the last half year or so we will do really well. At the same time, we have to execute what coach is saying and bring it everyday,” said Fabbro. A player to watch on the Black Bears’ bench is freshman defensive standout Simon Butala. Butala has appeared in every game for Maine and has logged 40 blocks for the Bears. Leading Butala and the rest of the Black Bears is senior captain Rob Michel, who has recorded 39 blocks of his own. Moving up the ice, the Black Bears have an extremely deep junior class at the forward positions. Mitchell Fossier, Chase Pearson, and Tim Doherty are the leaders in points for the Bears. The one player that BU will key in on is Fossier. Fossier’s vision on the ice is undeniable and has an impressive 27 assists for the Bears. If BU is able to subtract him from the play, Maine will have a much tougher time unlocking the Terrier defense. It is not the best of circumstances for the Terriers to play Maine away from their home ice, but with the confidence booster that they gained after beating Merrimack, the Terriers are flying high into their season finale up north. Along with their recent results, an improvement in health has given the Terriers reason to be optimistic going forward. BU has finally been gifted with the return of senior captain Bobo Carpenter, who missed more than a month with a lower body injury. Always providing leadership and an offensive spark, the Terriers have already noticed a difference with captain Carpenter back on the ice. If the Terriers want any shot at home ice in the playoffs, Saturday’s game is a must-win. Tell us what you predict will happen on Saturday’s match in the comments below! You can follow the game through our live blog as well as on Twitter. You can also listen to the game through GoTerriers.com. From the FreeP: Men’s hockey breakdown: BU versus Cornell — who has the edge? With the NCAA tournament on the horizon, Matt broke down the matchup between the Boston Univeristy men’s hockey team and Cornell University which can be found here. Over the upcoming few days Matt will also give his prediction for the tournament as well as give a preview for the game Saturday. No. 1 Boston College takes on No. 10 Merrimack at Conte Form. BC swept Merrimack in the regular season. No. 2 Northeastern hosts No. 8 UMass Amherst with both teams picking up a victory in their home-and-home series. No. 3 Providence hosts No. 6 Maine with Providence sweeping the regular season. No. 4 Boston University is set to host No. 5 UConn. The teams split the regular season 1-1-1. After the quarterfinals, the teams will be reseeded for the semi-finals. Liam and I will provide updates of the three other games via either twitter or our live blog. The Hockey East semifinals are here at long last, with an extra does of rivalry. Starting at 8 p.m., the No. 7 Boston University men’s hockey team will do battle with No. 14 Boston College, all with a berth in Saturday’s title game on the line. The game, held at TD Garden, will be broadcast on NESN and ESPN3. BU has beaten BC three times already this season, and an Eagle loss practically guarantees their NCAA Tournament dreams are squashed. As for BU, there’s all to play for ahead of what’s a guaranteed spot in the NCAA Tournament. We’ll be live all night at the Garden, so follow along below! What a weekend it was for the No. 8 Boston University men’s hockey team. Pegged against Northeastern University in the quarterfinals of the Hockey East Tournament, the Terriers had quite the task before them. The Huskies were 11-3 in their last 14 contests heading into the weekend and boasted two of the nation’s top-five scorers in forwards Dylan Sikura and Zach Aston-Reese. By Saturday night’s end, however, none of that mattered. Head coach David Quinn’s side dug deep in game one and game two, producing virtually identical performances to upend their cross-city foes. On both occasions, head coach Jim Madigan’s team jumped out to 2-0 leads in the first period, only for BU to turn into The Comeback Kids. Friday’s encounter went into overtime, while Saturday’s was decided with 24.9 seconds left – and each time a 3-2 scoreline in favor of BU stood tall. Looking ahead, BU now plays next Friday at TD Garden in the semifinals of the Hockey East Tournament against a to-be-determined opponent. Early indicators are it’ll face either Boston College or the University of New Hampshire, though. Now that the dust has settled, let’s reflect on the series that was against Northeastern. Friday’s recap, with a game-winning goal by Jordan Greenway. Friday’s sider on BU’s first-period woes. Saturday’s recap, with a game-winning goal by Chad Krys. Saturday’s sider on BU’s never-say-die attitude. Can't expect a goalie like Ruck to handle a sniper like Phelps. I would pay money for a highlight video of Krys' absurd ability to keep the puck in the zone. WE'RE HEADED TO TD GARDEN!! When Boston University and Northeastern square off on Saturday night, both will have high stakes on the line. The Terriers, fresh off a 3-2 overtime victory in game one of the Hockey East quarterfinals, will be playing for a berth in the semifinals next weekend at TD Garden. Meanwhile, the Huskies’ season will be on the line, as a loss guarantees their exit from postseason play. With those plotlines, puck drop is set for 7:05 p.m. at Agganis Arena, and the clash will be streamed on NESN and the American Sports Network. We’ll also be at Agganis all evening, so follow along on our live blog below!